Railpictures.ca - sdfourty Photo: Trains and Bridges, From the Pacific Avenue (?) 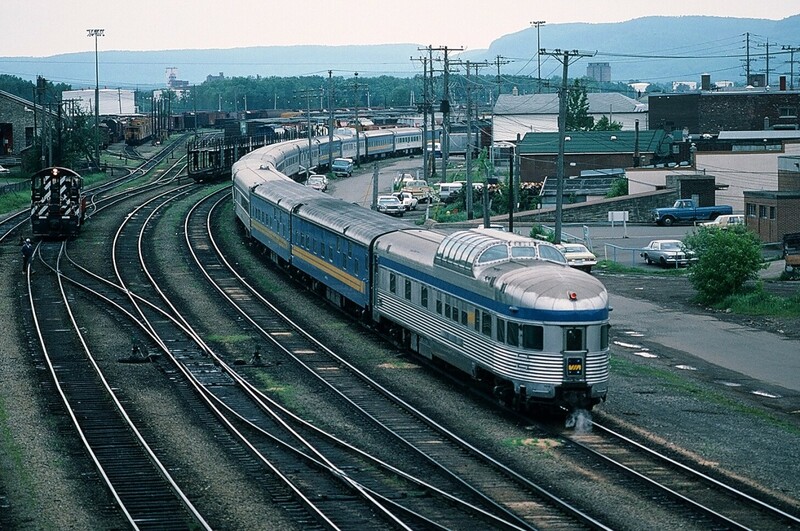 overpass, the Park car glides by as VIA Rail # 1 powered by GMD F units 6531 – 6623 – 6628 is on the approach to the CP Rail Thunder Bay station ( the former Fort William depot) . ( Appreciate if someone could confirm the exact location. sd. ). June 21, 1985 Kodachrome by S. Danko. More Northern Ontario by VIA: station centre of the community spectacular river bridge | Railpictures.ca – Canadian Railway Photography – photographie ferroviaire Canadienne. Copyright Notice: This image ©sdfourty all rights reserved. From the Pacific Avenue (?) overpass, the Park car glides by as VIA Rail # 1 powered by GMD F units 6531 – 6623 – 6628 is on the approach to the CP Rail Thunder Bay station ( the former Fort William depot) . ( Appreciate if someone could confirm the exact location. sd. ). June 21, 1985 Kodachrome by S. Danko. Very nice image! Lots of Edward G Budd’s best! I hear Pacific Ave is fatal nowadays!